Is it time for a new set of bars or fork? Subrosa have released the new Simone Barraco signature Simo Bars and Simo Fork to go with the new Simo Frame that we took a look at about a week back. The Simo Bars are made from 100% post-weld Deathproof heat-treated, 13-butted 4130 chromoly tubing with a 28″ width, 10-degrees of backsweep and 3-degrees of upsweep. 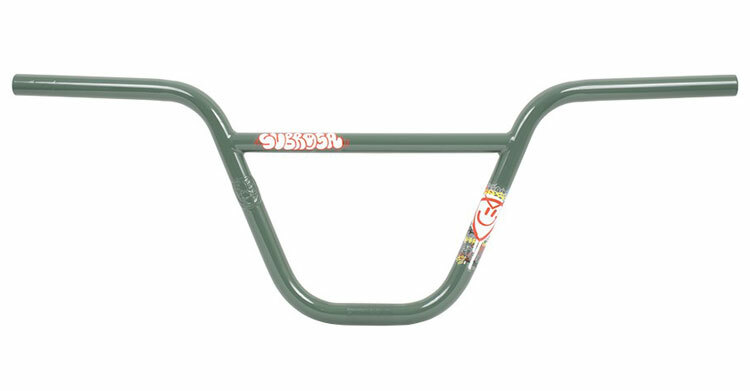 The Simo Bars come in 8.8″ and 9.3″ rise options with Black, Chrome and Sage Green colors and a weight of 28.7 oz. (8.8″) for $72.99 – $82.99 depending on color. You can pick the Simo Bars up through BMX shops and mail-orders that carry Subrosa worlwide now, or in the Subrosa Webstore! The Simone Barraco signature Simo Fork is made from 100% post-weld Deathproof heat-treated chromoly tubing with a 1-piece CNC machined steerer tube, tapered legs with an increased inner fork leg radius to fit 2.40″ tires with plenty of room to spare and 27mm offset dropouts with clearance for pegs and hub guards. The Simo fork is available in Black, Chrome and Sage Green colors, weighs in at 32.1 oz. for $141.00 – $156.00 depending on color. You can pick this fork up through BMX shops and mail-orders that carry Subrosa worldwide now or through the Subrosa webstore now! What do you think of the new Simone Barraco signature Simo Bars and Fork? Do you have any questions? Let us know in the comments below! Make sure you check out the Simo Frame while you’re at it! Note: This post contains affiliate links and we could receive a small commission if you were to purchase these bars or fork from the Subrosa webstore. We would never share a product we didn’t think was quality. Is it time for a new BMX Fork? Have you given the Inceptiv Fork from The Shadow Conspiracy a look yet? The Inceptiv V2 fork is made from 100% post weld heat-treated 4130 chromoly tubing with a one-piece, 165mm long steerer tube with a built in crown race, oversized, butted and tapered legs with 6mm thick Investment Cast dropouts with a 26mm offset and a 6061-hard anodized alloy H24 compression cap. This fork comes with an anti-rust ED paint coating. The Inceptiv V2 fork comes in Black and Chrome colors, weighs in at 36 oz. (2.25 lbs.) and can be picked up at BMX shops and mail-orders that carry The Shadow Conspiracy worldwide now, or direct from The Shadow Conspiracy Webstore for $149.99 (black) / $161.99 (chrome) now. What do you think of the Inceptiv V2 fork? Do you have any questions? Let us know what you’re thinking in the comments below! NOTE* – This post contains affiliate links and we could receive a small commission if you were to buy this fork from The Shadow Conspiracy. We would NEVER tell you about a product unless we were 100% confident that it is a great product. If you’re feeling like you need some gold in your life, Kink have you covered! Kink have released their Foundation 2 Fork, Pillar Cranks and Solace 2 Bars in this new metallic gold colorway that looks real shiny and nice. If you’re digging the color and want to add some shine to your bike, this might just be what you need. 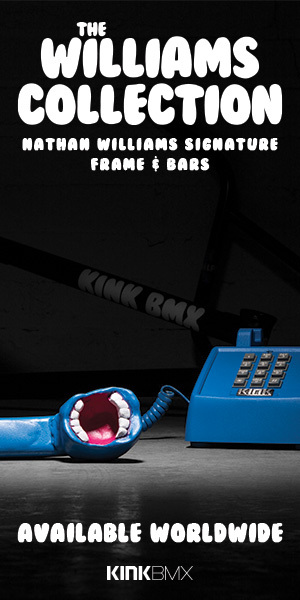 The fork, cranks and bars are available through BMX shops and mail-orders that carry Kink BMX worldwide now. The Pillar Cranks in this new gold colorway. The Tony Hamlin signature Solace 2 Bars also come in this new gold color! What do you think? Do you have any questions? Let us know what you’re thinking in the comments below!